It is 1948 and Britain is struggling to recover from the Second World War. Half French, half English, Marguerite Carter, young and beautiful, has lost her parents and survived a terrifying war, working for the SOE behind enemy lines. Leaving her partisan lover she returns to England to be one of the first women to receive a degree from the University of Cambridge. Now she pins back her unruly auburn curls, draws a pencil seam up her legs, ties the laces on her sensible black shoes, belts her grey gabardine mac and sets out towards her future as an English teacher in a girls' grammar school. For Miss Carter has a mission – to fight social injustice, to prevent war and to educate her girls. Through deep friendships and love lost and found, from the peace marches of the fifties and the flowering of the Swinging Sixties, to the rise of Thatcher and the battle for gay rights, to the spectre of a new war, Sheila Hancock has created a powerful, panoramic portrait of Britain through the life of one very singular woman. 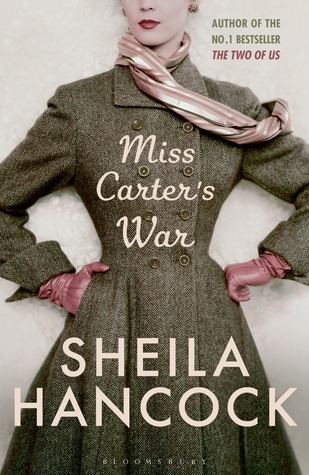 I wasn’t sure what to expect from Miss Carter’s War and I don’t think what I read was at all what I’d envisioned the novel to be. Initially I thought we were going to explore Marguerite’s resistance through World War II and how it impacted her subsequent teaching life after being one of the first women to receive a degree from the University of Cambridge. Instead we followed her from that root all the way through her adult life into retirement and there was a good deal to keep up with throughout the novel. The basic plot line and friends and relationships was simply laid out- Miss Carter didn’t have a lot of chances to make friends as a teacher (which I imagine was likely the case for many women in her position) but the friends she did make were invaluable to her life. The friendship with Tony was obviously her life love, though their relationship was not a love affair. I found it interesting that a woman with so much conviction, confidence and clarity would never find the right person to share her life with. The novel went zipping through from the 1940’s to the 1990’s with an emphasis on the changing political climate in the UK following the war- the education system, the breaking down of class systems and the demand for equal opportunities . There was a huge amount covered in one novel and to be quite honest I may have missed a few important bits! The story was written in such a way as to make you want to follow Miss Carter’s life - the history lesson just slid alongside her story nicely. To watch the decades unfold so quickly in the novel actually made it clear just how much times had changed in that 50 year period- it was a bit strange to read about it as it mirrored my mother’s own lifetime and to see just how much had changed from her childhood was fascinating and daunting. Miss Carter’s War was fast paced and, on occasion a bit too informative for me (! ), but I enjoyed it and raced through it to hopefully find a satisfying conclusion for this woman’s fascinating lifetime.